The majority of work in an Objective-C application happens as a result of messages being sent back and forth across an ecosystem of objects. Some of these objects are instances of classes provided by Cocoa or Cocoa Touch, some are instances of your own classes. The previous chapter described the syntax to define the interface and implementation for a class, including the syntax to implement methods containing the code to be executed in response to a message. This chapter explains how to send such a message to an object, and includes coverage of some of Objective-C’s dynamic features, including dynamic typing and the ability to determine which method should be invoked at runtime. Before an object can be used, it must be created properly using a combination of memory allocation for its properties and any necessary initialization of its internal values. This chapter describes how to nest the method calls to allocate and initialize an object in order to ensure that it is configured correctly. The reference on the left, someObject in this case, is the receiver of the message. The message on the right, doSomething, is the name of the method to call on that receiver. In other words, when the above line of code is executed, someObject will be sent the doSomething message. Literals and object creation are explained further in Objects Are Created Dynamically, later in this chapter. Sending an Objective-C message is conceptually very much like calling a C function. Figure 2-1 shows the effective program flow for the sayHello message. In order to specify the receiver of a message, it’s important to understand how pointers are used to refer to objects in Objective-C.
C and Objective-C use variables to keep track of values, just like most other programming languages. are limited in scope to the method in which they are defined. In this example, someInteger is declared as a local variable inside myMethod; once execution reaches the closing brace of the method, someInteger will no longer be accessible. When a local scalar variable (like an int or a float) goes away, the value disappears too. Objective-C objects, by contrast, are allocated slightly differently. Objects normally have a longer life than the simple scope of a method call. In particular, an object often needs to stay alive longer than the original variable that was created to keep track of it, so an object’s memory is allocated and deallocated dynamically. Note: If you’re used to using terms like the stack and the heap, a local variable is allocated on the stack, while objects are allocated on the heap. Although the scope of the pointer variable myString (the asterisk indicates it’s a pointer) is limited to the scope of myMethod, the actual string object that it points to in memory may have a longer life outside that scope. It might already exist, or you might need to pass the object around in additional method calls, for example. The greeting pointer behaves like a local variable and is limited in scope just to the saySomething: method, even though the actual string object that it points to existed prior to the method being called, and will continue to exist after the method completes. Note: NSLog() uses format specifiers to indicate substitution tokens, just like the C standard library printf() function. The string logged to the console is the result of modifying the format string (the first argument) by inserting the provided values (the remaining arguments). There is one additional substitution token available in Objective-C, %@, used to denote an object. At runtime, this specifier will be substituted with the result of calling either the descriptionWithLocale: method (if it exists) or the description method on the provided object. The description method is implemented by NSObject to return the class and memory address of the object, but many Cocoa and Cocoa Touch classes override it to provide more useful information. In the case of NSString, the description method simply returns the string of characters that it represents. For more information about the available format specifiers for use with NSLog() and the NSString class, see String Format Specifiers. As well as passing values through method parameters, it’s possible for a method to return a value. Each method shown in this chapter so far has a return type of void. The C void keyword means a method doesn’t return anything. When this method call returns, revisedString will point to an NSString object representing the characters HELLO WORLD!. the string object continues to exist when it is passed as a return value even though the stringToReturn pointer goes out of scope. There are some memory management considerations in this situation: a returned object (created on the heap) needs to exist long enough for it to be used by the original caller of the method, but not in perpetuity because that would create a memory leak. For the most part, the Automatic Reference Counting (ARC) feature of the Objective-C compiler takes care of these considerations for you. Whenever you’re writing a method implementation, you have access to an important hidden value, self. Conceptually, self is a way to refer to “the object that’s received this message.” It’s a pointer, just like the greeting value above, and can be used to call a method on the current receiving object. 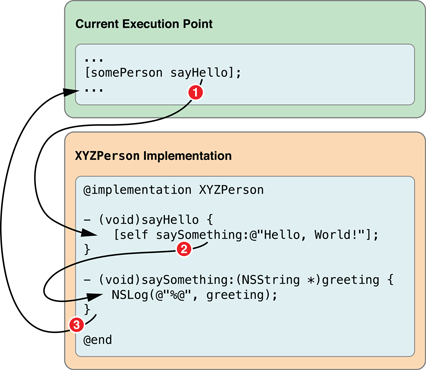 You might decide to refactor the XYZPerson implementation by modifying the sayHello method to use the saySomething: method shown above, thereby moving the NSLog() call to a separate method. This would mean you could add further methods, like sayGoodbye, that would each call through to the saySomething: method to handle the actual greeting process. If you later wanted to display each greeting in a text field in the user interface, you’d only need to modify the saySomething: method rather than having to go through and adjust each greeting method individually. 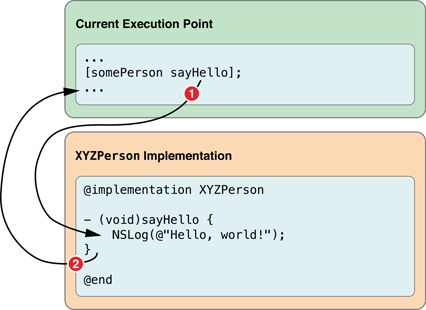 If you sent an XYZPerson object the sayHello message for this updated implementation, the effective program flow would be as shown in Figure 2-2. There’s another important keyword available to you in Objective-C, called super. Sending a message to super is a way to call through to a method implementation defined by a superclass further up the inheritance chain. The most common use of super is when overriding a method. This example declares an extra string pointer, uppercaseGreeting and assigns it the value returned from sending the original greeting object the uppercaseString message. As you saw earlier, this will be a new string object built by converting each character in the original string to uppercase. Because sayHello is implemented by XYZPerson, and XYZShoutingPerson is set to inherit from XYZPerson, you can call sayHello on an XYZShoutingPerson object as well. When you call sayHello on an XYZShoutingPerson, the call to [self saySomething:...] will use the overridden implementation and display the greeting as uppercase, resulting in the effective program flow shown in Figure 2-3. The new implementation isn’t ideal, however, because if you did decide later to modify the XYZPerson implementation of saySomething: to display the greeting in a user interface element rather than through NSLog(), you’d need to modify the XYZShoutingPerson implementation as well. 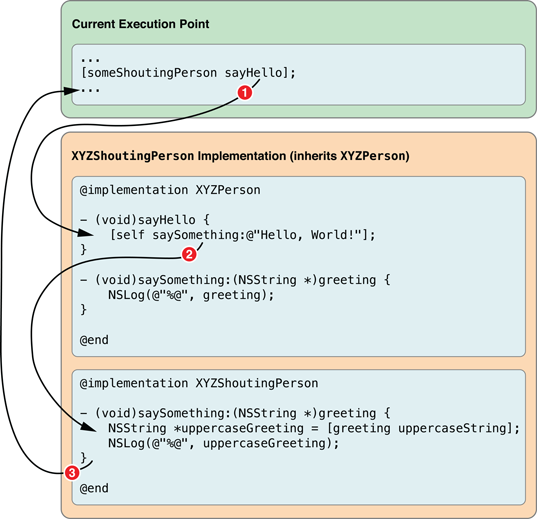 The effective program flow that now results from sending an XYZShoutingPerson object the sayHello message is shown in Figure 2-4. As described earlier in this chapter, memory is allocated dynamically for an Objective-C object. The first step in creating an object is to make sure enough memory is allocated not only for the properties defined by an object’s class, but also the properties defined on each of the superclasses in its inheritance chain. Notice that the return type of this method is id. This is a special keyword used in Objective-C to mean “some kind of object.” It is a pointer to an object, like (NSObject *), but is special in that it doesn’t use an asterisk. It’s described in more detail later in this chapter, in Objective-C Is a Dynamic Language. The alloc method has one other important task, which is to clear out the memory allocated for the object’s properties by setting them to zero. This avoids the usual problem of memory containing garbage from whatever was stored before, but is not enough to initialize an object completely. The init method is used by a class to make sure its properties have suitable initial values at creation, and is covered in more detail in the next chapter. Note that init also returns an id. This example sets the newObject variable to point to a newly created NSObject instance. The innermost call is carried out first, so the NSObject class is sent the alloc method, which returns a newly allocated NSObject instance. 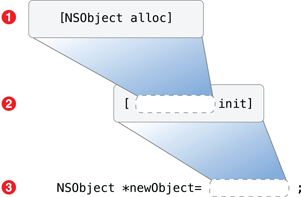 This returned object is then used as the receiver of the init message, which itself returns the object back to be assigned to the newObject pointer, as shown in Figure 2-5. Note: It’s possible for init to return a different object than was created by alloc, so it’s best practice to nest the calls as shown. If the call to init returns some other object, you’ll be left with a pointer to the object that was originally allocated but never initialized. Some objects need to be initialized with required values. An NSNumber object, for example, must be created with the numeric value it needs to represent. As mentioned in the previous chapter, a class can also define factory methods. Factory methods offer an alternative to the traditional alloc] init] process, without the need to nest two methods. This is effectively the same as the previous example using alloc] initWithInt:]. Class factory methods usually just call straight through to alloc and the relevant init method, and are provided for convenience. It’s also possible to create an instance of a class using the new class method. This method is provided by NSObject and doesn’t need to be overridden in your own subclasses. Some classes allow you to use a more concise, literal syntax to create instances. NSString *someString = [NSString stringWithCString:"Hello, World!" Again, each of these examples is effectively the same as using the relevant initializer or a class factory method. In this case, the expression is evaluated, and an NSNumber instance created with the result. Objective-C also supports literals to create immutable NSArray and NSDictionary objects; these are discussed further in Values and Collections. As mentioned earlier, you need to use a pointer to keep track of an object in memory. Because of Objective-C’s dynamic nature, it doesn’t matter what specific class type you use for that pointer—the correct method will always be called on the relevant object when you send it a message. The id type defines a generic object pointer. It’s possible to use id when declaring a variable, but you lose compile-time information about the object. In this case, someObject will point to an NSString instance, but the compiler knows nothing about that instance beyond the fact that it’s some kind of object. The removeAllObjects message is defined by some Cocoa or Cocoa Touch objects (such as NSMutableArray) so the compiler doesn’t complain, even though this code would generate an exception at runtime because an NSString object can’t respond to removeAllObjects. means that the compiler will now generate an error because removeAllObjects is not declared in any public NSString interface that it knows about. Although both firstPerson and secondPerson are statically typed as XYZPerson objects, secondPerson will point, at runtime, to an XYZShoutingPerson object. 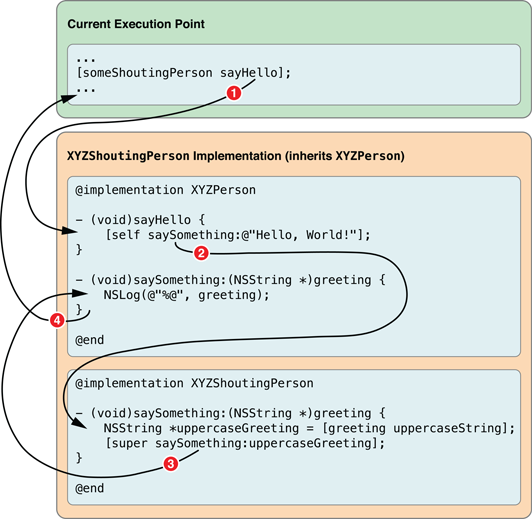 When the sayHello method is called on each object, the correct implementations will be used; for secondPerson, this means the XYZShoutingPerson version. If you need to determine whether one object is the same as another object, it’s important to remember that you’re working with pointers. If the somePerson variable is nil, its logical value is 0 (false). If it has an address, it’s not zero, so evaluates as true. Open the main.m file in your project from the exercises at the end of the last chapter and find the main() function. As with any executable written in C, this function represents the starting point for your application. Create a new XYZPerson instance using alloc and init, and then call the sayHello method. Note: If the compiler doesn’t prompt you automatically, you will need to import the header file (containing the XYZPerson interface) at the top of main.m. Implement the saySomething: method shown earlier in this chapter, and rewrite the sayHello method to use it. Add a variety of other greetings and call each of them on the instance you created above. Create new class files for the XYZShoutingPerson class, set to inherit from XYZPerson. Override the saySomething: method to display the uppercase greeting, and test the behavior on an XYZShoutingPerson instance. Implement the XYZPerson class person factory method you declared in the previous chapter, to return a correctly allocated and initialized instance of the XYZPerson class, then use the method in main() instead of your nested alloc and init. Tip: Rather than using [[XYZPerson alloc] init] in the class factory method, instead try using [[self alloc] init]. Using self in a class factory method means that you’re referring to the class itself. creates the correct type of object. Create a new local XYZPerson pointer, but don’t include any value assignment. Use a branch (if statement) to check whether the variable is automatically assigned as nil.